Did you know that 22.9 percent of the Australian population is suffering from moderate to severe gum disease according to the Department of Health? Moreover, gum disease is more prevalent in older generations than the younger ones. We should keep in mind that mouth care is not just about your teeth alignment or your killer smile, but it includes healthy gums as well! In this article, I’ll share with you the indicators to determine if your gums are healthy or not, the possible health complications when you don’t take care of your gums and five surprising ways to keep your gums healthy. First, you need to be aware of what’s going on in your mouth. You need to familiarize yourself with the indicators of whether your gums are healthy or not. What are the indicators that your gums are not healthy? The most common reason your gums are unhealthy is the buildup of plaque under and along your gum line. This is often associated with improper mouth hygiene and a diet of processed food low in vitamins, minerals and healthy fats. The Weston A. Price Foundation has conducted an extensive study of indigenous cultures exhibiting healthy teeth based on natural nutrition. Plaque appears like a sticky film substance filled with bacteria, food particles, and mucus. When plaques are not removed, they harden and form tartar, which houses more bacteria that migrate below the gum line & erode bone around the roots of your teeth. At the early stage, you wouldn’t really know that you have a gum problem because a gum disease is painless initially until you experience gingivitis or inflammation of the gums. When this happens, your gums will appear red and swollen. Your gums feel tender and they bleed easily. You will often feel discomfort when chewing food and even when your tongue touches the affected gums, it can result in either pain or bleeding. Mostly, the bleeding incidents are more apparent when you are brushing your teeth and/or flossing. These might be minor discomforts in your mouth but you need to find out what’s going on or else, you might end up having a severe gum disease and losing many teeth. Why do you need to pay much attention to your gum health? Remember that your bones and gums hold your teeth in place. That is why it’s crucial to treat any gum disorder like gingivitis immediately and as much as possible practice preventive measures. Besides, untreated gingivitis leads to mild to moderate periodontitis, wherein the inflammation and bleeding of the gums worsen. At this stage, the bacterial toxins in the plaque and your body’s own defense may break down the attachment of your gums to the teeth. By then, you will notice that your gums are pulling away from your teeth. If the condition remains untreated, your teeth may loosen and you might lose some bones that surround your teeth too. Sores and gum ulcers may develop as well. So, it’s painful to chew food, your gums are swollen, your teeth are loose and sensitive, your gums are receding, what else could be worse? Well, a gum disease can also cause constant bad breath! Unless your gum disease is treated, the bacteria in your infected gums will keep releasing smelly gas. Moreover, persistent bleeding may cause some blood to stick on your gum lines and in between teeth surface, which contributes to foul-smelling breath. On the other hand, unhealthy gums may also indicate that there’s an underlying disease. Sometimes, it’s not just about a mouth disease. At times, the condition of your gums is telling you that you’re suffering from a candida infection, diabetes, cancer, gastroesophageal reflux (GERD), autoimmune disease (Crohn’s disease, lupus, multiple sclerosis), vitamin C deficiency or you have a high level of free radicals in your body. And these conditions require further medical interventions. Now, I have gathered five surprising ways to keep your gums healthy. These are best practiced as a preventive measure, which means before you even develop any gum disease, you need to act now and maintain your gums’ health. Otherwise, if you are already experiencing the signs and symptoms of a gum disease, then your best option is to consult your health practitioner. If you want to maintain your healthy gums, oral hygiene or mouth care must be your top priority. 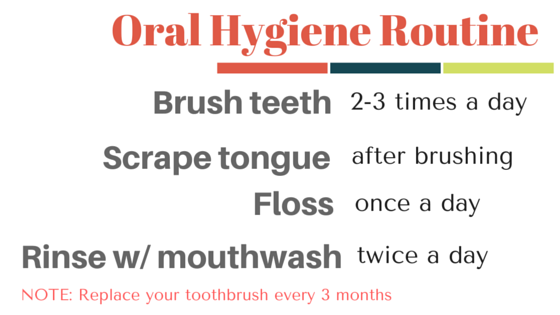 Ideally, you need to practice oral hygiene 2-3 times a day. You have to brush and floss your teeth, rinse your mouth with mouthwash and scrape your tongue. Performing this mouth care will help remove food particles, plaque, and bacteria or their toxins. Thereby, protecting you from bad breath, gum disease, tooth decay and cavities. Here are points that you need to remember when doing mouth care. First, brush not only your teeth, but also your gums and tongue as well. It should take 2-3 minutes to brush thoroughly. You need to replace your toothbrush every three months too. When it comes to flossing, you may do it at least once a day. It will help you clean the areas that toothbrush can’t reach and that’s about more than 1/3 of your tooth surface. Make sure to floss both sides of every tooth including the back of your last molars. You have to wipe each tooth from the base (under the gum line) to tip about 2-3 times. Next, you need to rinse with mouthwash twice a day after brushing your teeth. It will help remove loose bacteria. As much as possible, choose a brand that is alcohol-free to prevent drying up of your mouth cavity, which makes it difficult to flush away bacteria. Lastly, start using a tongue scraper if you haven’t tried yet. It is good for mouth detox and a stainless tongue scraper is the best option for its durability and safety. After brushing, scrape starting at the back of your tongue going forward, and then sides of your tongue surface. Don’t forget to rinse! Next, boost your vitamin C intake. #2 Add more foods rich in vitamin C to your diet. You know vitamin C is an immune-boosting vitamin and antioxidant right? But did you know that this vitamin is also essential in maintaining healthy gums? Vitamin C supports collagen formation and prevents it from breaking down. Collagen is an important protein that maintains and repairs the connective tissues and this includes those connective tissues that glue your teeth and gums together. When you lack vitamin C, it is tantamount to collagen deficiency. And this will result in loose teeth that may even fall out as the connective tissues erode. Your gums will become tender and may start bleeding too. You can get more vitamin C from guavas, yellow bell pepper, dark green leafy vegetables, kiwifruit, broccoli, strawberries, citrus fruits, tomatoes, peas and papaya. 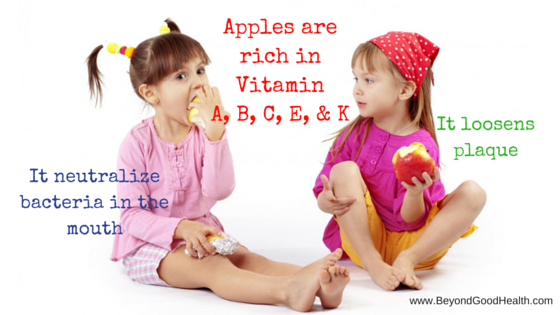 Another thing is you must make it a habit of eating at least one apple a day. Apples really have a universal benefit. It keeps the doctor away including your dentist! It takes a while to eat an apple, right? You take time munching this fruit and that’s beneficial for your mouth. How? Munching initiates a cleansing action. It loosens the plaque that clings to your teeth and gums. It is also rich in vitamins A, B, C, E and K. It’s even high in fiber content. Aside from that, chewing longer stimulates saliva production that neutralizes bacteria in the mouth. Moreover, a regular dental exam can help in the early detection and treatment of gum disease. 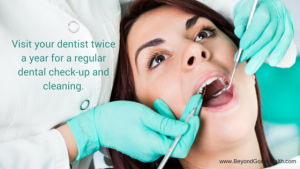 Visit your dentist twice a year for a regular dental check-up and cleaning. A dental checkup helps examine your teeth and gum health. It’s a way to diagnose if you have developed a gum disease. During the checkup, the dentist will examine the physical condition of your teeth, gums and entire oral cavity. The dentist will also check for gum bleeding, which is an indicator of swelling and infection. Your dentist will also take your medical history to identify any risk factors that may contribute to gum disease or other underlying diseases that could be causing your gum problem. Likewise, you should submit yourself for a dental check-up if you’re experiencing signs and symptoms of gum disease such as red, tender and swollen gums, mouth sores, loose teeth and even bad breath. A general dentist may also refer you to a gum disease specialist known as a periodontist. Aside from that, a regular dental cleaning would be helpful in removing plaque and tartar that accumulated over time, which are not easily removed by regular oral hygienic practices. 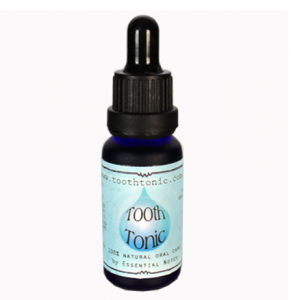 Last but not the least among the ways to keep your gums healthy is using Tooth Tonic essential oil. Tooth Tonic is a teeth and gum care product made of natural essential oils from cinnamon, clove, grapefruit, immortelle, lemon myrtle, mentha piperata, natural vitamin E oil, oregano, spearmint, turmeric and fennel. Blending these natural ingredients in a formula provides Tooth Tonic its antibacterial, antifungal, antiviral, antioxidant, and anti-inflammatory properties. It protects and nourishes your teeth and gums, and improves your overall oral health. In fact, this is effective for gingivitis. Tooth tonic has a clean minty fresh aroma too, which keeps bad breath away. If you’ve enjoyed this article and you want more valuable tips and support, then you can do 3 things right now. Sign up for our newsletter with high quality health and wellness tips. We at Beyond Good Health can help you. Beyond Good Health Holistic Medical Clinic Brisbane and Gold Coast offer holistic health services tailored for your specific health needs. 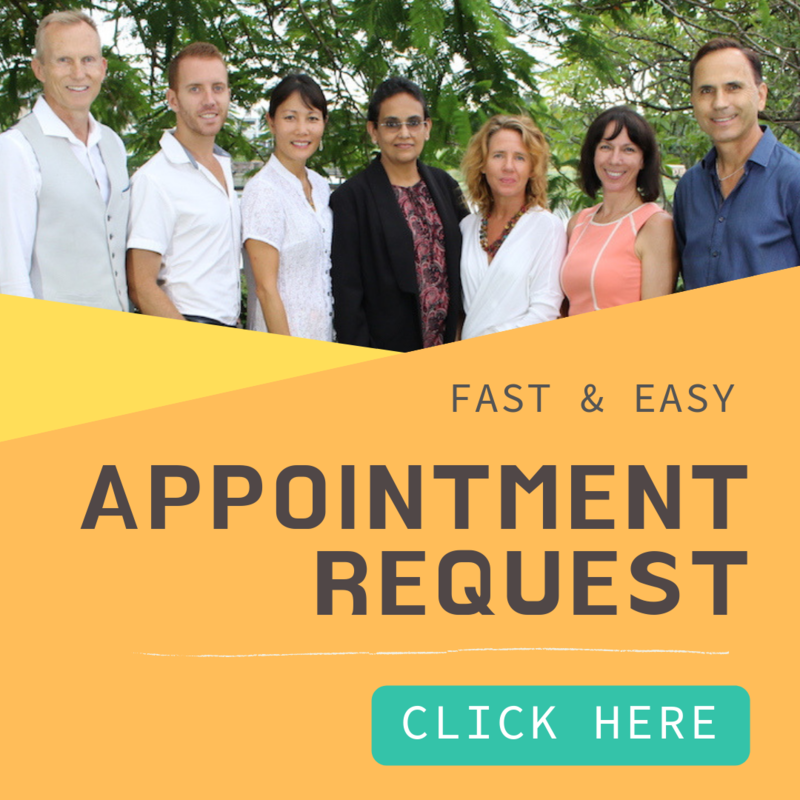 To book for our special 60-minute introductory offer, you need to click HERE and have your overall health status checked by our expert alternative medicine practitioner in Brisbane and Gold Coast. For ALL new clients, we also offer for a limited time, a BONUS 30-minute comprehensive Body Scan. What will you get? We will take your detailed health history, discuss your current health symptoms, identify your high-risk behaviour and environmental factors, outline a personalised step-by-step plan for your health journey and a BONUS full 3D body scan of all body systems! Click on one of the social media buttons below and share this valuable information with all the people your care for. We believe in sharing is caring! Kimballe helps professional women suffering from Chronic Fatigue Syndrome to restore their wellness by applying Nutrition Therapy, Bioresonance & Vibrational Therapy, Iridology and Theta Healing Techniques.